A Few Paragraphs: Cereal Killer on the Loose! Cereal Killer on the Loose! A horrendous atrocity has occurred in the state of Tennessee that strikes at the heart of everything we hold dear. Unfortunately, the deed cannot be undone at this late date, but we can still do what Americans have always done with perpetrators of crimes against humanity: hunt them down and make them pay! 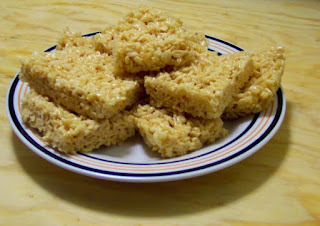 Kellogg's Rice Krispie Treats, as we all know, are one of the most heavenly and delectable food items ever devised by the mind of man. Well, actually, more than likely, by the mind of woman. At any rate, Rice Krispie Treats have brought untold joy to millions and soothed many a wounded soul in their hour of need. But now a story has emerged that's almost too hard to stomach. In 2014, at Kellogg's Memphis, Tennessee plant, a man (if he can even be called a 'man') unzipped his pants and peed -- yes, genuine urination my friends! -- peed all over the Rice Krispie Treat conveyor belt! As if that were not enough, he splashed some on the nearby Rice Krispie Treat Cereal belt too! The goody-adulterating monster was so proud of his deed that he taped it all on his smartphone and put it on the Internet (although he waited 2 years to do it, the fiend!). But don't fret that you might accidentally eat some of the defiled bars, because you probably already did. Those boxes have long since passed their expiration dates, and been gobbled down by unknowing consumers. The same goes for your kid's breakfast cereal as well. Criminal psychologists tell us that men who relieve themselves in cereal factories seldom do it just once. This villain is most likely a serial cereal urinator, and has undoubtedly urinated elsewhere. We must track him down and put him somewhere far from all crunchy treats. Stop him before he pees again!